Many Inspiration Blog readers are service-based providers who work with clients. If this is you, in order for someone to decide to work with you, you probably need to talk to them. That is, they might get exposure to you through a free talk or webinar that you give – or, perhaps you offer a free consultation of some sort. Your niche wants to be talked to in a particular way. This is essential. While you do need to know how to put together a great talk and/or conduct a powerful consult, if you don’t talk to your clients in the way they desire, there will be a disconnect. And this impasse will get in the way of inspiring clients to work with you. Corporate types use a particular lingo and terminology, and holistic practitioners utilize very different terms. If you work with intellectuals, they’ll enjoy your using bigger words; if your clients are more blue-collar, those same words will alienate them. Becoming increasingly fluent in their pains and desires. Intimately know both what they want as well as where they’re stuck. For example, I know very well that many of my clients suffer from nervousness or fear around speaking… or having a monotone voice… or don’t know how to craft a powerful talk that inspires and enrolls. You also need to know about who they are personally. Most people I serve are on a path of personal development and spiritual growth, as am I – so I also express that clearly when I talk with them. Oh, speaking that way will repel those who aren’t my niche. And that’s a good thing: I get to work with clients I love, and can refer out those who would better be served by someone else. Have you had a practice for more than a year or two? (At first, it’s good to try working with different people, hone your skills, and get a sense for you who like. ), If so, then honestly… it’s time to hone your niche. It’s essential. If you don’t know who your clients are, you don’t know where to find them, among other things. In terms of communication and speaking, if you don’t have a niche, you will likely be speaking very generically – both in terms of how you speak and your message. Which means that you won’t be particularly compelling to anyone. Well, you’ll still be yourself… but often when we are trying to speak to everyone, we can wash out the colors of our true personality, and not shine in our full glory… and that’s of course what inspires clients to work with us. Let me say it again: a successful practice for service-based providers – like coaches and holistic practitioners – needs a niche. A good niche, one that’s right for you, is defined so you get to work with all of the clients you LOVE, and doesn’t exclude anyone with whom you want to work. By the way, as an Intuitive Business Strategist (one of my hats), one of my favorite things to do is to help coaches and holistic practitioners clarify their niche and message very quickly, so that it connects deeply with their life purpose and highest service. If your practice lacks focus (and maybe profits) because of not being clear of your audience, you’re invited to be in touch – email me or schedule a time to chat. In sum, by deeply knowing your niche – and how to speak to them and how to serve them – you can love them more fully. And they’ll feel loved. That’s my idea of good business. How do you talk to your niche? How do you bring out your personality, and connect more deeply? Or, what problems are you facing? Leave a question or comment below. Today’s my 42nd birthday. According to Douglas Adams of Hitchhiker’s Guide to the Galaxy, 42 is the answer to “life, the universe and everything.” The real conundrum, though about this answer: what is the actual question? That’s a little bit of what my life is: a search for meaning, for purpose, for answers. Since my path is transparency and authenticity, I’d like to “WholeSpeak” with you – to share with you some of my growth over the past year and beyond… and, if you’re in a stuck or growing place, I hope it might provide a little insight or inspiration. …So, things are going really well. This year I finally broke 6 figures in my business. But that really doesn’t make me jump for joy. I’ve always valued happiness and fulfillment over money. After all, I’m a theatre artist as well as a coach: self-expression and truth are of the utmost importance. Yet, a few years ago, I had to come to terms with the fact that I didn’t know enough about business, and that I was $30K in debt from simply under-earning. And I was frustrated and depressed that the world didn’t seem to appreciate what I had to offer. I won’t tell the whole story since this is a long email anyway, but I finally really did the inner work, shifted, and in 2 months’ time had like 8-10 clients a week – during the two weeks of Christmas and New Year’s!! Soon after, I started paying for a lot of coaching so I could make my results grow and be consistent. All told, it took me around two and a half years to pay off $40,000 ($30K plus another $10K in coaching programs – I spent much more than that, actually, but used a small inheritance from my grandfather’s passing). The truth is that every online program launch was about paying off my debt more quickly. Sigh. And this summer it was DONE! It’s amazing to now have money in the bank. I can choose to upgrade my lifestyle to what excites and fulfills me more. In sum: a few years ago I just wanted to pay my bills by doing my own work. Two years ago I had my sights on paying off my debt. And now that it’s done, the question is: what’s the life I truly desire? For the past few years I’ve sacrificed my theatre work (doing only small, side projects, instead of big creations like I had been doing) in order to have a real business. But I chose this from a place of higher guidance, because I got the clear message that growing my coaching business would not just be financially smart, but also transform me… and it has. Yet, I’ve also felt like a poseur in my theatre community; it’s been hard on my ego. I’m ridiculously impatient. I want to do everything *now* – theatre, workshops, writing 4 books… you get the picture. Plus, I became single again this year and am now dating… and want to find that one extraordinary woman… which takes focus too! So what’s next, and aligned, for my life and business? Yes, I’m a kickass coach (I’ve been doing it 17 years – I sure hope so, by now! 🙂 ) and people love my online trainings. But what excites me the most? Live group workshops. It’s where I shine. As well as speaking, performing, and creating theatre. Greatly reducing my private coaching practice, or possibly leaving it. Note: if you want to work with me but have been waiting, now’s the time. Yes, I’m a little scared to declare that! Much still has to unfold. Also, I’m not sure of the fate of my online programs (see below). Leading live events and workshops. Whee!! …Honestly, I get a little scared about marketing these, because I know my community is international – for which I’m ridiculously grateful!! Yet, will they fly out for something that I’m deeply called to create? I know, though, that the transformation that happens live is unparalleled, so it’s simply gotta happen. More theatre, performing and live speaking. While I love helping others shine, I need to more fully claim my own voice! Being far more provocative. The truth is that I’m a provocateur. Example: I recently bought the domain name “UnconsciousBusiness.com” (which would have the tag line “Business as Usual”) to create a parody site. I feel so strongly that the world needs to be transformed and uplifted – and I MUST speak my full truth, and deliver my true message. A new platform. My work is going to shift away from mainly public speaking (although it will likely still be a subset of my work), directly into the deep transformations that happen when people work with me… personal power, self-love, authentic and expansive self-expression, deep connection, and more. I’m dying to share the details, but feel I need to keep it inside to cook a little longer before I reveal it publicly. What I can tell you, though, is that my framework is that transformation can be FUN. Imagine personal growth workshops where you have more fun than you thought possible, while growing incredibly in a safe space. Stay tuned. You can create change in your life anytime. It’s accessible… when you’ve truly had enough of things staying the same… and especially when you choose to get help from an expert who really resonates. Positive change (in business or in our personal lives) can happen really quickly – especially if we do the INNER work first. Otherwise we end up just blocking ourselves. Live Your TRUTH! Listen to the experts… and then follow your own path. So, there you have it. Thanks for reading this whole thing – I know it’s long. I’m hoping that sharing my journey may be helpful for yours. What steps would you like to take to be more true to your own calling and path? Please speak your truth, and inspire others – share your comments below. I just returned from spending an amazing 3 days with 75 other top coaches at an intensive retreat in San Francisco, the Conscious Business Playground. I went knowing that we would be examining common practices engaged in by those of us who participate in conscious business (as a coach, practitioner or entrepreneur), and seeking to uplevel industry standards. I thought that I was already doing pretty well in this arena, since authenticity is a must for me, but I wanted to learn. And I did. Boy, did I! So, I want to humbly share my experience. Now, I won’t name all the names in the room for confidentiality’s sake, but you’d know many of them – all quite big names – business coaches, wellness coaches, relationship coaches, and personal transformation experts. And we covered many deep topics – both for our internal growth and how we do business – that contained room for all of us to grow. For example, we discussed how newsletter marketing isn’t working so great these days, because trust has eroded in the entire industry. Most people just assume they’ll be marketed to, and not given actual value, so they don’t bother to open their emails (and thank you for opening this one!!). If you read my posts from time to time, you probably know that I always strive to be authentic and real. It’s a super high value for me, to speak honestly, and as one human to another. However, when I really dug into it this weekend, I realized that a subtle energy of lack, and mistrust in the Divine, pervaded my motivations. Sure, my business is going very well. But I realized I was, on some level, wanting to control things. Like, if I didn’t use particular marketing methods that everyone else does and which I was taught (such as the format of sales pages, for instance, which I just dislike in general), I feared that people might not join my trainings – no matter the quality of my work. This subtle fear and mistrust surely gets conveyed energetically – and also means that, on some level, I perhaps haven’t been trusting the universal flow of energy, or my own value. Shifting this, now, is already leading to a significant deepening of myself in relationship to my business… I seek to become even more conscious about every aspect of my business, at a higher level. To hold every single thing I do in highest consciousness, surrender and trust. And to make sure that I am likewise appreciative and fully respectful of you, and your path, too. Why is it so hard to keep our consciousness raised around our businesses? A big part of the problem, in my opinion, is that we emulate what others are doing. That’s not always a bad thing: I believe it important to know the path well-traveled, because it’s likely that it has worked for others. And, if we want do do things our way, it’s essential to know what works in order to deviate from it. Instead of reinventing the wheel, or trying to drive on triangles or cubes, we can make the wheel our own. Another problem: for fear of things going badly, we can become risk-averse… and then we stop innovating, or even cease doing what we truly love. This strain of thought may bring to mind certain newsletters or interactions that felt salesy or manipulative. However, this is the problem with trying to grow: it’s easy to critique what others are doing that feels out of alignment… but much harder to really look at our own stuff. What aspects of my business don’t feel aligned? What practices have I learned from others that don’t totally feel right? What would I like to make my own? Knowing that making mistakes is part of the path, what seemingly risky ideas do I simply want to try, in order to make this path truly mine? One of my other huge takeaways from this weekend was my deep desire to continue to forge collaborations and be in community. So I would truly love to hear your responses. Would you be willing to share some of your reflections? If so, please comment below, so that we can all learn together. Thank you – your sharing will inspire and move so many others! I hope my reflections and lessons I’m learning are helpful for you. May we all raise our consciousness further – in our personal lives and in our work in the world – to create the planet on which we wish to live. 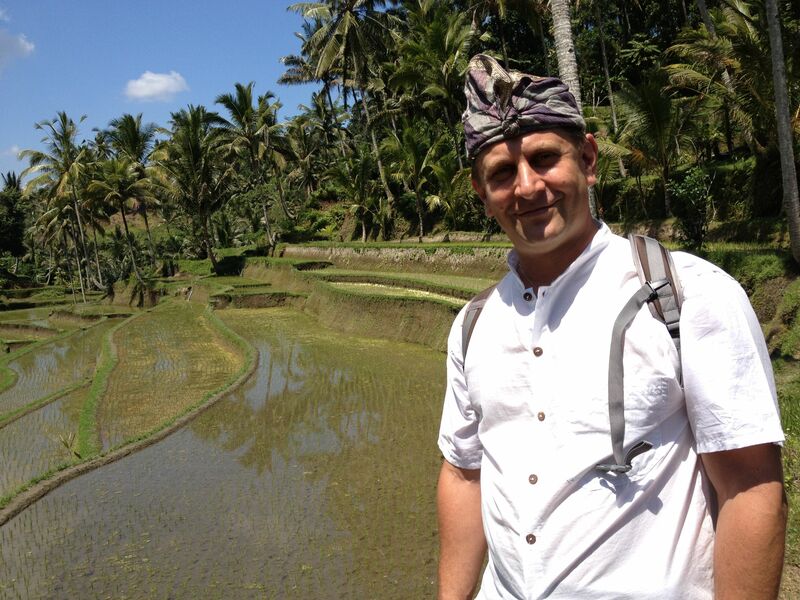 I had the great fortune to spend the past few weeks in Bali, and wanted to share a little about my journey – and some insights that might be of service to you – for your business, for public speaking, with networking, or in your life. Why Bali? Well, I was going to go to Detroit… and decided Bali sounded better. No, really: I was headed to Detroit to see my sweet baby nephew Luca and for a business workshop, when I realized that what I truly needed, and hadn’t had for quite sometime, was a vacation – a journey both outer and inner. And I desired a blend of the spiritual, adventure, and culture… and chose a destination I had always wanted to visit. It’s *amazing* how something that feels so far away can become yours so quickly. One other qualifier: I desired a place I would enjoy going as a single man. I completed a long-term relationship this spring with a woman who was wonderful, but we had to admit it just wasn’t serving either of us anymore, despite our best intentions. While I’ve done a huge amount of healing and growth work during the past several months, and am in a truly wonderful place now, this would be my first time doing a long solo vacation in many years. And… the past 3 weeks were utterly magical. I meditated and prayed in traditional ceremony in temples throughout Bali, seen incredible performances, and much more. It was also a process of inner growth: when I felt lonely, I realized I had left the Divine Flow, and remembered to return to it. Much of my trip was taking trust, and committing to the divine flow of energy in life, to an entirely new level. When I was truly in a place of trust, things flowed, I always met amazing people, and my cup truly ranneth over. How does this apply to public speaking? Second: we are never alone. Trusting the flow of life brings true connection. If you haven’t heard me talk about it, I totally geek out on connection; I’m a little obsessed by it. Because we’re never alone. We can be present with ourselves. There is Divine Source with us always too. And there are many other people around who are available to connect with – if we open to them. But we must begin by connecting with ourselves. Then we honor ourselves and have an inner foundation from which to relate to others. And as far as getting clients is concerned… Connection is the heart of networking. True connection must be made – not superficial banter – in order to make contacts that become clients, referral partners, and friends (which I find just as valuable). If you haven’t heard my talk on networking, I bring a very unusual perspective on it, and am speaking about it on an upcoming interview. I’ve now returned to the US, with a great tan, but far more importantly with a greatly enlivened spirit. Now that I’ve connected inwardly, and had an incredible journey, I’m renewed to be of service again. I’ll be leading a private training next week in LA, then have a trip to Colorado. Note: If you’re in LA or Colorado and want in-person support, email me to get just 1-2 session times available in either location. And, check out the offerings below for some great support and free resources. Zahra’s experts, including myself, invite you to take this step now, not only for yourself… but for the world that is calling you to share your gifts. before you jump into taking tons of action. (Take the right steps – not just random ones!) The result will be less overwhelm, more income and a life and business filled with ease and abundance. Look, here’s the deal: it’s far, far more difficult to be successful or attract a stable client base if you don’t have a niche. I work with clients all the time to help them clarify who they truly seek to serve – and spend time with – and to make a real mark in the world. Finding your niche is essential. Yes, I know you can help everyone. But there isn’t exactly time to. Where do you want to make your mark? Who do you deeply and truly want to serve the most? It takes time to find a niche – and most coaches and practitioners need to narrow their niche far more. how even something like yoga (that can help everybody) can be niched a bunch of different ways. No matter what, remember: connection, with yourself and with others, provides meaning as well as makes for good business. Take a peek at these great offerings to support you. And no matter whether you’re on vacation, at home, or in a networking event, trust that you are being guided forward on your path. Why in the world should confidence be a problem? To be honest (which I always am – it’s my M.O. – but I’ve never addressed this before), I’ve never loved the term. Yes, this is true even though “confidence” is in the subtitle of my upcoming training and I talk about it a lot. Why? Because for many, it is about the ego. For example, I’ve heard many coaches declare, “You just gotta be confident!”… as if implying that confidence is easy, or that it can be somehow pasted on. Often, confidence is forced or misguided. When confidence isn’t 100% real, your nonverbal communication looks forced and pushes people away. This is different than true confidence – which is completely relaxed – even humble, because you don’t need to prove anything to anyone… including yourself. It’s largely a reflection of being present, centered, and being able to deal with anything. And while you can fake confidence, what cannot be forced is presence… and self-acceptance… and deep connection with an audience. When we’re confident, it’s easy to think we know everything. And no one knows everything. In my 17 years of coaching public speaking, I’ve never seen a single speaker, be it live or on YouTube, who couldn’t improve. Every day, I see confident speakers making basic mistakes – ones that can be easily rectified. Not authentically connecting with the audience. And if they don’t connect with you, they won’t be moved to work with you. Mistaking loud volume for being a dynamic speaker. I focus with clients on 6 primary vocal dynamics, 4 advanced speaking styles, and powerful ways to use gestures, facial expressions and body language. Most speakers don’t even get close to exploring their full range. Not realizing that speaking in front of larger groups, and other high stakes situations like selling from the stage, can cause you to lose your confidence. We all need methods to become more relaxed and centered, when on a growing edge. Skipping public speaking essentials. Can I tell you how often I see confident speakers betraying themselves by using ineffective body language, a plethora of “ums” and more? Far more than I’d like. Oy vey. The strength of people without confidence is that they realize they need to learn. And who doesn’t need to grow? For yourself – and to grow your business? If you haven’t seen it, I’d like to invite you to check out my free video training on speaking with confidence and presence, at http://www.yourtruevoice.org. If you consider yourself a confident speaker, in Claim Your Voice you’ll also learn how to get more comfortable when selling from the stage and other high-stakes situations. And learn a ton of other skills – read my article on The Public Speaking Must-Haves. In any case, here’s the deal with confidence… it’s pretty much 3 things: getting the skills you need, relaxing/centering, and trusting your capacity to handle anything that happens. Which of these is your next step? What are the Public Speaking Must-Haves? For many, being an effective speaker is a mystery; for others, they feel fairly comfortable and think that’s all they need. Since speaking is the best way to get known as an expert and build your business, it’s important to really know how it works. Over the past 17 years of coaching public speaking, I’ve developed a thorough breakdown of everything necessary to speak powerfully. It can be categorized into 3 levels. Strong Content. It’s essential to know how to put together a great presentation – how to grab attention at the beginning, keep your audience members engaged both emotionally and intellectually, and move them to want to work with you or follow your call to action. Knowing how to warm up for a presentation, and how to recover if you lose your mojo mid-way through. The inner mindset – how you treat yourself (are you critical? Fearful? Or self-accepting and caring for yourself?). Clear Enunciation. Don’t make the audience struggle to understand you. No Fillers, such as “Um.” If these are largely present, they’ll undermine your credibility. How to completely relax. Body tension will hurt your presence as well as your voice. How to stand. The right position will cause to both look and feel more confident. How to walk. Aimless wandering or pacing will hurt; deliberate steps and walks will guide your audience through your presentation. Gestures. Those hands aren’t just meant to dangle there! Facial expressions. These also help establish connection, while they bring out more of your personality. Connection. You simply must authentically connect with your audience in order to move them. There are 9 aspects of connection, 7 of which are pertinent to speaking, so it’s a long topic, but you need to begin with connecting with… yourself. Eye contact. Strong eye contact will cause every person in the audience – no matter how large it is – to feel like you’re speaking directly to them. Integrated Comfort and Connection. When you learn to easily get yourself into a state of being where you are both fully at ease, and also deeply connected with your audience (and with yourself! ), you’ll be on your way. Staying Fully Centered. Few people can do this under great pressure; those who can become leaders. Knowing how to breathe deeply is a good start – and many other exercises help with this. Enhancing the Voice. This includes finding a more resonant, relaxed voice. It’ll then literally resonate more fully with your audience. Advanced Vocal Dynamics. Mastering how – and when – to utilize and combine pitch, tempo, volume, pausing, enunciation variation, and tone will help you hold the audience’s rapt attention at all times. There are also 4 powerful speaking styles, which you can use effectively (more difficult to describe in brief, so I’ll leave it at that). Advanced Body Language. Beyond the basics, there is a deeper level of movement available to you. Yoga is a good start; movement techniques used by actors and dancers will take you even farther. Mastering Emotion. Acting techniques will help you find a fuller range of emotion to express yourself and move the audience. Charisma. While the above elements help bring it out (especially when they’re combined), this also arises from more advanced acting techniques. Professionally Crafted Content. While the standards for crafting a talk work at all levels, to move to another level, the content is fused with emotions. That is, everything you say is deeply stirring or moving – no matter what the topic. What level are most speakers at? Unfortunately, I’ve found that the majority of speakers who don’t suffer from a lot of fear are somewhere around mid-level 1. That is, they feel somewhat comfortable, but still really need to master the essentials of body language and the voice. The sad part is that because they feel a little confident, they don’t get the help they need to really step up their game. Want to learn these skills quickly, instead of taking years figuring it out yourself? My training program, Claim Your Voice: Speak with Power and Presence, covers Levels 1 and 2. There’s less emphasis on content, which is easier to implement; thorough guidelines are provided for participants to apply themselves. The biggest difficulties in speaking lie in all of the other areas, which are far trickier and more nuanced. Even if you’re doing okay right now, you may have little idea how much better you can be! When you transform your connection skills, body language, presence, and mindset, the audience will be completely yours. If you’re ready to step into your full potential as a speaker, you are warmly invited. Please go to http://www.ClaimYourVoiceNow.com for full details and to register. And, if you’d like another perspective and hear me speak about it, watch a free video training at http://www.yourtruevoice.org.